You will be met at the airport in Nice and transferred to the Emerald Liberté luxury star ship in Arles where you will be welcomed by your Captain and crew. Tonight, enjoy a welcome reception and dinner on board. Join your local guide for a walking tour showcasing the highlights of the city, in particular the 2000-year-old Roman Amphitheatre still in use today, which was originally built to hold 20,000 spectators in the style of the Colosseum in Rome. Uncorked: Meet British wine expert, Tim Atkin for a Q&A session. EmeraldPLUS: Provençale dinner hosted by local Chef Fabien Morreale with wines paired by Master of Wine, Tim Atkin. Avignon has a rich history from Celtic beginnings to being the residence of the Popes and later central to the French Revolution. Although a fortified town, it is the Papal Palace which stands more secure on a hill in the centre of town; its walls are 17-18 feet thick. Your guided walk with a local guide takes you through this historical centre strolling the cobbled laneways and browsing the ships, overlooking the famous ‘Pont d’Avignon’. Uncorked: This afternoon challenge your taste buds with a visit to the famous Chateauneuf-du-Pape wine cellars with Tim Atkin who will discuss his thoughts on the wine of the region. 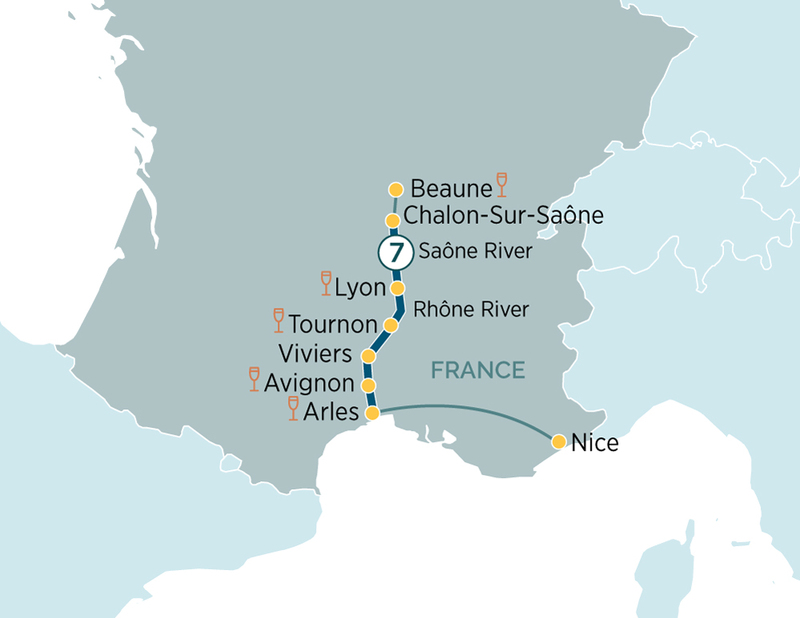 EmeraldACTIVE: Guided hike in Avignon and/or Yoga lesson on board. Arrive in Viviers, a town which still has a lot of flare. Viviers is also the home of one of France’s oldest cathedrals. Join an included city tour exploring all the architectural heritage of this quaint town. Join your local guide for a walking tour of Tournon, which is dominated by the 16th century castle and roman ruins, and is nestled in the valley near the steep slopes of le Massif Central, France's 3rd largest mountain range. The area has a long tradition in wine making, including the renowned wine growing centre of Tain l'Hermitage across the river. Uncorked: Guided active walk through vineyards accompanied by US wine expert, Robin Stark. Uncorked: You’re Invited to a regional wine tasting on board with Australian wine expert and Master of Wine, Andrea Pritzker. Lyon is France’s third largest city, a former Roman capital positioned at the conference of the Rhone and Saone rivers, which is steeped in history. Today take part on the guided tour of Lyon, which starts with a drive to the Basilique Notre Dame de Fourvière, Lyon’s hilltop church, with stunning views over the town. Then pass by the recently re–discovered Roman amphitheatre and walk through the cobbled streets of the gastronomic old town including the secret laneways. Alternatively, join a guided bike tour of Lyon. Uncorked: Enjoy a sweet treat this afternoon in an on-board dessert wine tasting masterclass with US wine expert, Robin Stark and Australian wine expert, Andrea Pritzker. Chalon-Sur-Saône is best known as the birthplace of photography and the centre of Burgundy’s wine region. Travel by roach to the quaint village of Beaune, where we visit the Hospices de Beaune, one of the finest examples of French fifteenth-century architecture. Marvel at the multi-coloured roofs of this former hospital, now a museum, which has become one of the symbols of Burgundy. Uncorked: This morning as part of your guided tour you will visit Chateau Meursault accompanied by Canadian wine expert, DJ Kearney for a private wine tasting. Uncorked: This afternoon enjoy free time in Chalon-Sur- Saône followed by a cheese and olive tasting paired with DJ Kearney’s favourite wines. After breakfast, disembark the Emerald Liberté in Lyon and transfer to the airport for your onward or homebound flight. Meet some esteemed names from the world of wine, as we sail through the wine-producing region of Provence. Witness the stunning vineyards, with plenty of opportunity to sample the local wares.